I don't know about you, but there are certain things that simply seem off limits in my own kitchen. I mean who on earth could, or would even want, to make bacon or gummy bears or phyllo at home in their own kitchen? You'd have to be insane. 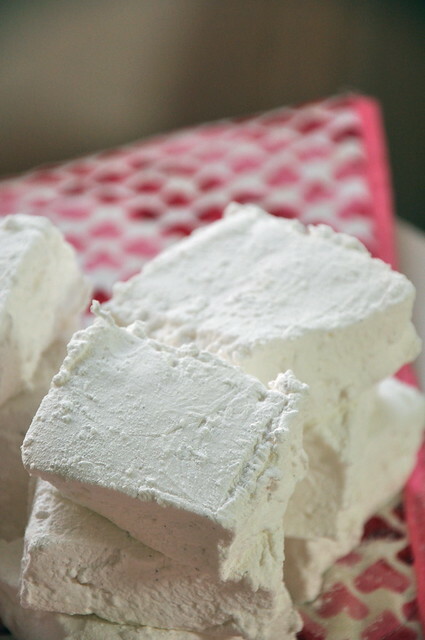 For most people, marshmallows would be on that list. They seem like one of those magical things that cannot be made in a home kitchen. You buy them in a big plastic bag in the aisle, and that's that. No questions asked. 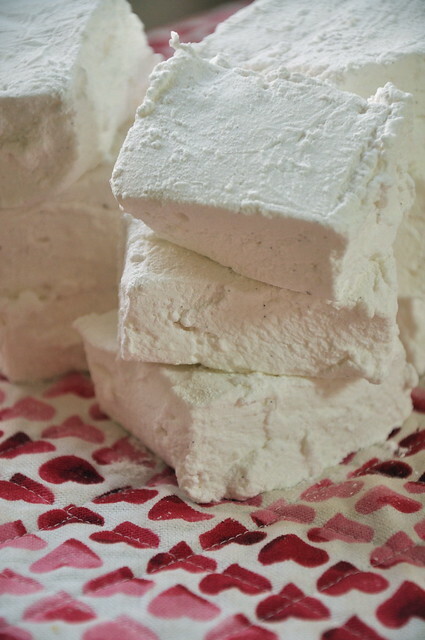 No s'more has ever complained about the lack of homemade marshmallow. No mug of hot chocolate has ever refused the addition of a good ole Campfire marshmallow. However, I never saw marshmallows in that light. Every holiday season, my mom would lug out Martha Stewart's trusty guide to everything Christmas, flip past the plum pudding and cassoulet, and run her hand down the center of the book, opening it to the page with the marshmallows. Somehow, it never got old. 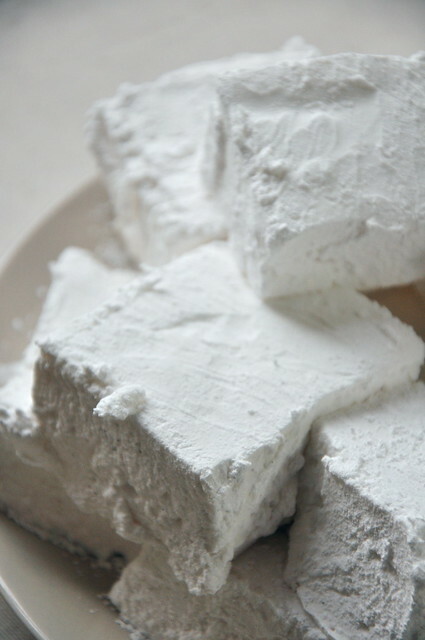 To this day, I continue to be amazed when, after all is said and done, a lovely powdery plate is stacked high with ice-white marshmallows. We always cut them into festive shapes, which left tons of scraps for my brothers and me to nibble on as the army of cookies baked in our ovens. I find that simple squares do just fine and help cut down on waste (although my grumbling tummy may beg to differ). Because I like my hot chocolate a little more seasonal, I add a splash of peppermint extract to the mix. You could even coat them in crushed peppermints if you were feeling extra audacious. Originally Posted on Small Kitchen College Ingredients Butter, at room temperature, for greasing 20 grams fine leaf gelatin 3/4 cup cold water, divided 2 cups granulated sugar 2/3 cup light corn syrup 1 teaspoon vanilla extract Powdered sugar, for coating To prepare the baking dish: Butter a 9-by-13-inch baking pan. Line with plastic wrap and lightly butter plastic wrap. Lightly butter a second piece of plastic wrap and set aside. 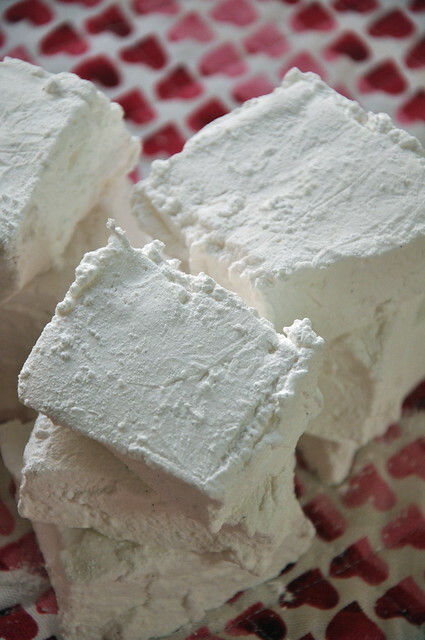 To make the marshmallows: In the bowl of an electric mixer, lay sheets of gelatin over 1/2 cup cold water. Let sit for 10 minutes. In a medium saucepan over medium-high heat, combine 1/4 cup cold water, granulated sugar, and corn syrup. Briefly whisk to combine. Bring to a boil, and boil for 1 minute. Remove from heat. Attach whisk attachment to mixer and, with the mixer on high, pour syrup into mixer. Continue beating for 12 minutes. Add peppermint extract and beat until thoroughly incorporated. Using a spatula, scrape mixture into prepared baking dish. Cover with plastic wrap, butter-side-down. Let stand for 2 hours. 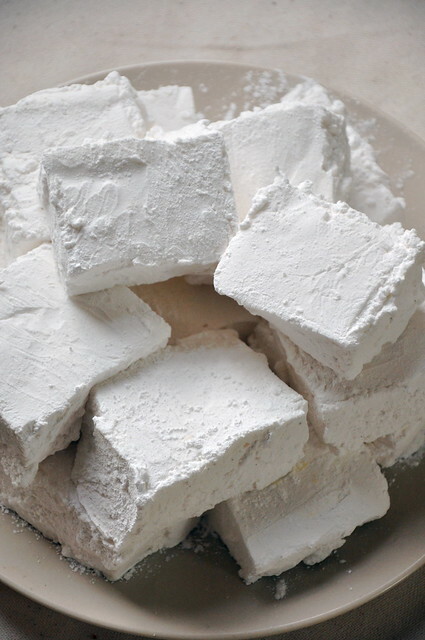 Remove marshmallows from pan, cut into squares, and coat with powdered sugar or crushed peppermint candies. This is a wonderful post and those marshmallows look splendid!